Schools across the world will participate in an Hour of Code on December 3 - 9th as part of Computer Science Education Week. Interested in participating or enhancing your lesson plans? Check out our must-watch inspirational coding videos plus helpful blogs and websites on teaching coding. No computer? No problem - try out our favorite unplugged coding activity! Before we jump into resources, why teach coding in the first place? As you know, coding is behind all the amazing technologies in our lives, and many STEM career pathways require coding knowledge. More importantly, coding requires problem solving and communication skills plus lots of patience and persistence to accurately tell a computer or robot what to do. Teaching these skills at an early age is critical to developing confidence and building a foundation of skills for success in STEM. From basic block coding to C++, endless resources are available to help educators teach coding skills for all levels. If you are new to programming and are looking for some great beginner resources, we recommend the following blogs and websites to jump-start your journey in teaching coding to kids. You may also wish to check out our list of apps and products on our STEM resources page for more! The concept of coding can be difficult for children to grasp. 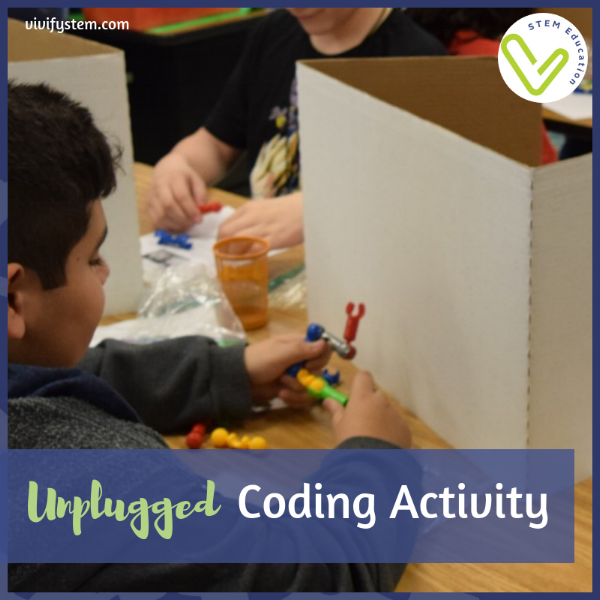 Various unplugged activities can be used to gain a basic understanding of coding and how it works before progressing to robotics and online coding apps. What you need: Students are placed into pairs with a bag of materials. We love using the Zoob connectors for this activity, but Legos or other building materials that connect together will work. Ideally, materials have different colors and shapes to create an interesting final design. How the activity works: A barrier is placed between students so they can work in secrecy to build a “tool” out of the provided materials. Once finished, students write a series of commands to explain how to build the tool. The instructions are presented to their partner (Robonaut) to attempt to re-create the tool using only the written instructions. The barrier is then removed to compare tool designs! I love using this activity as an introduction to coding before moving on to Code.org or SPRK programming. Students gain an appreciation for the challenges in coding, and after the tool reveal, students often end up in a spirited discussion on how to improve instructions. The activity also involves critical thinking to concisely communicate ideas while also practicing math vocabulary, writing, and spatial reasoning skills. Access the complete lesson plan with student handouts here. Looking for more unplugged activities? Continue the theme of robotics and add an engineering design challenge with our new Robot Hand STEM Challenge! With only straws, string, tape, and paper, students create a movable hand to grab objects! This STEM challenge guides students through learning about the human hand and how to design and build their own hand. Students will be amazed at the ability of their paper hand to pick-up and move objects!